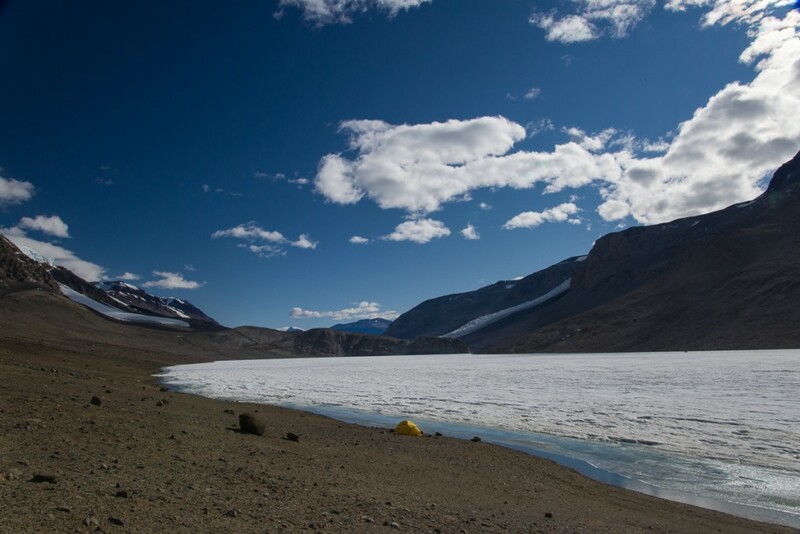 Lakefront lodging: my tent pitched on the shore of Lake Bonney in the Dry Valleys, the way the site looked the day before it snowed. 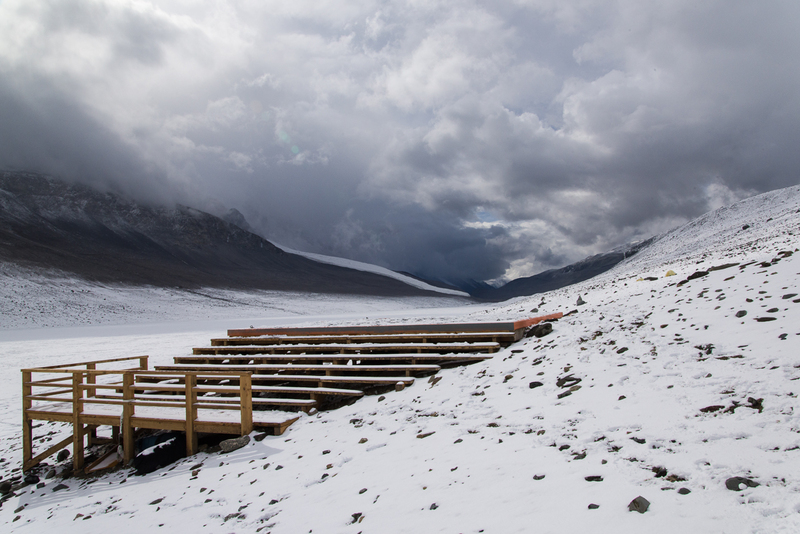 I arrived in the Dry Valleys on Dec 16th with mountaineer Forrest McCarthy. We were dropped off at Blood Falls, a spectacular site (and sight) with a glacier stained orange from iron in the soil. I’ll post those photos another time, as well as photos I took on a hike at the top of a steep ridge where there are ventifacts — large granite boulders carved by the wind into surreal shapes. But today I’ll just post a few photos of the site and the limnology team of the Dry Valleys LTER (long-term ecological research site) at work. Limnology is the study of inland waters as ecological systems interacting with their drainage basins and the atmosphere. 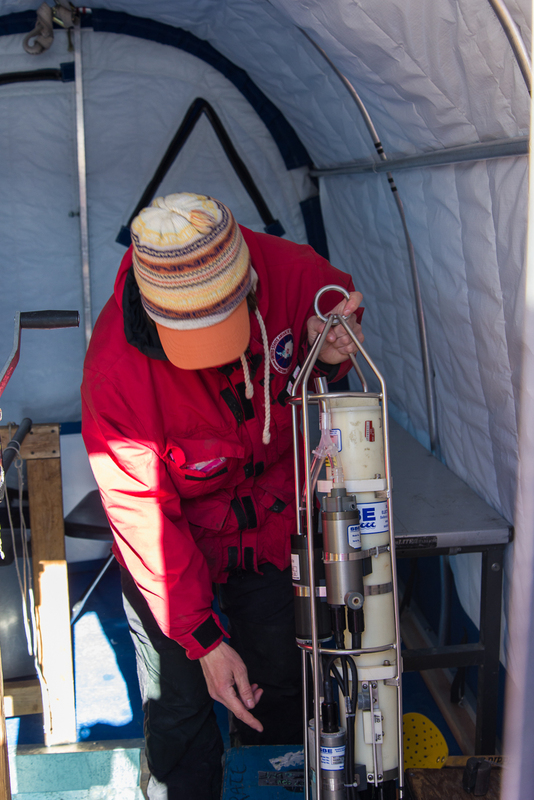 The Dry Valleys limnology team takes water samples from the various lakes in the area, all of which are mostly ice covered: including Lake Bonney, Lake Hoare and Lake Fryxell. They move from one to the other throughout the season. Lake Bonney Jamesway where the science teams cook and relax — slated to be replaced with a more modern structure in the near future. The lab is in a separate structure on the far side of this structure. The limnology team consists of research leader Amy and three grad students, Jeff, Maddie and Noelle. On collection days they work long days, getting up at 4 a.m. to collect samples at specific times and filtering them into the evening. The first two days I was there, they had a lot of work to do. When I wasn’t out hiking and photographing, I watched them collect samples. 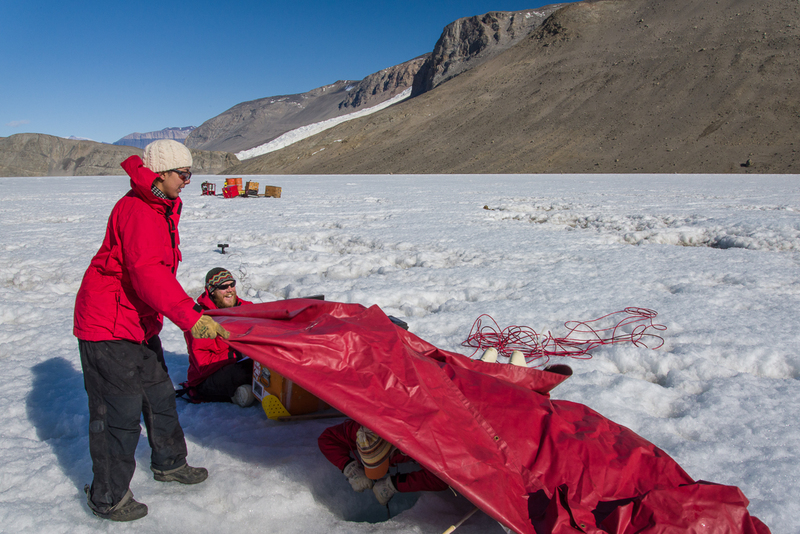 Amy lies on the ice ready to lower the sample bottles into the hole, while Noelle and Jeff assist. The lake is about 4 meters thick. She’s going to bring up samples of phytoplankton so it has to be dark. After she was done, I sat under the tarp and took some photos of the inside of the hole in the ice. Amy prepares a measuring instrument to be lowered into a hole in the ice inside a small hut. 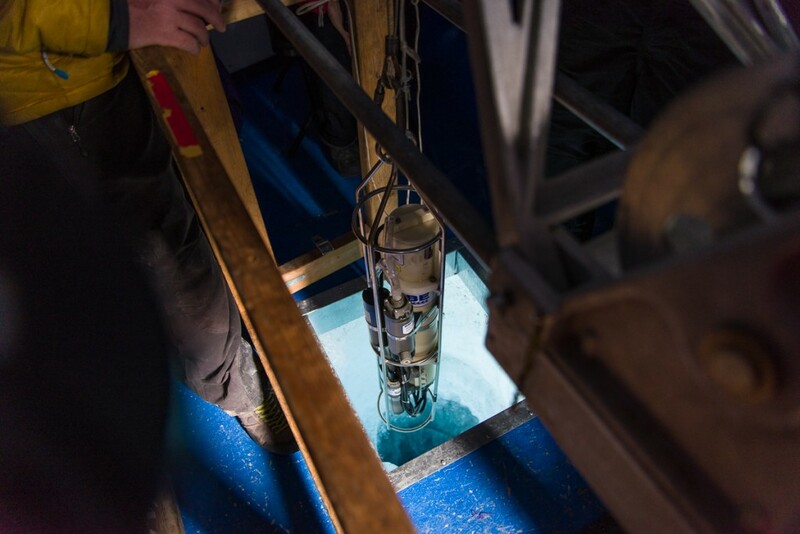 This one attaches to a cable and measures various aspects of the water at different depths. Instrument being lowered into the water. Those crazy kids of the Lake Bonney limnology team took advantage of a sudden wet snowstorm and a day off from filtering samples to build a snowman. 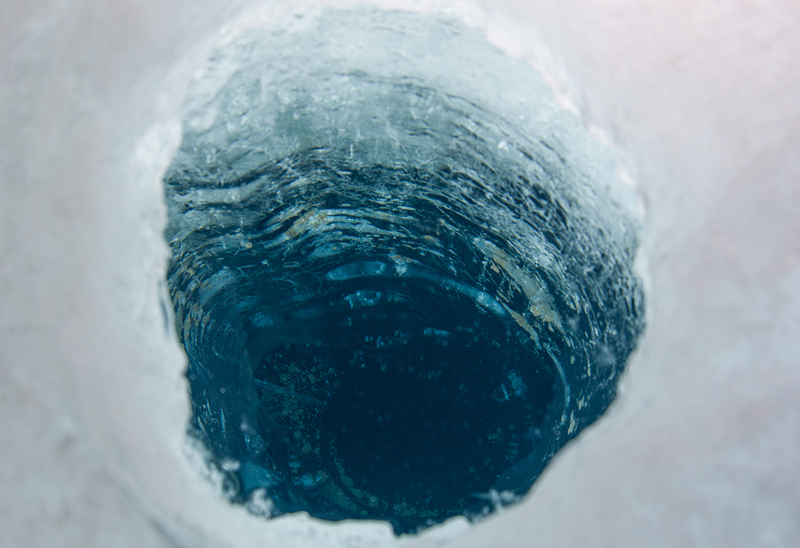 Amy also showed me an instrument that is lowered by a cable into a hole in the ice to take measurements at various depths of the water. She tested it first and made some adjustments to make sure it was pumping properly. This instrument has been around for at least a couple of decades. My last day there, Forrest and I took down my tent and packed up our stuff. 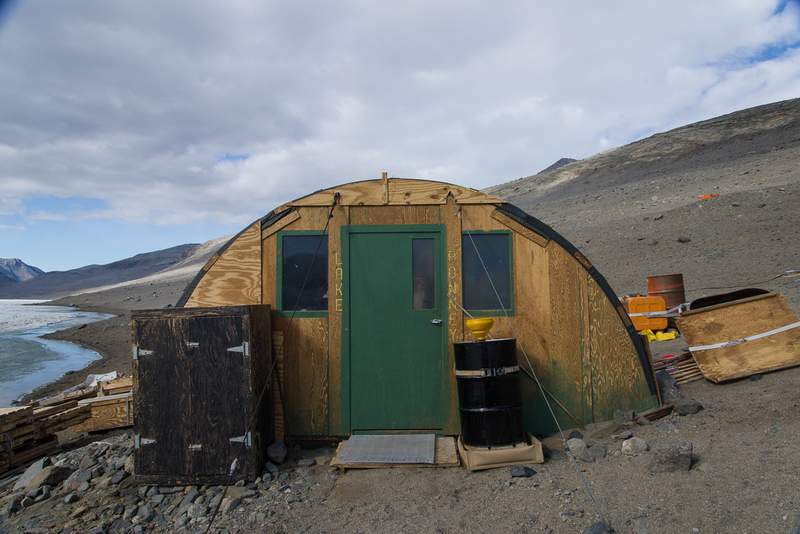 We were scheduled to get a helicopter ride to a different camp in the Dry Valleys this afternoon, at Lake Hoare, where I’ll spend the next four days. We were going to hike to another ventifact spot but decided against it when a sudden shower of an unusually large amount of unusually wet snow just wouldn’t quit. 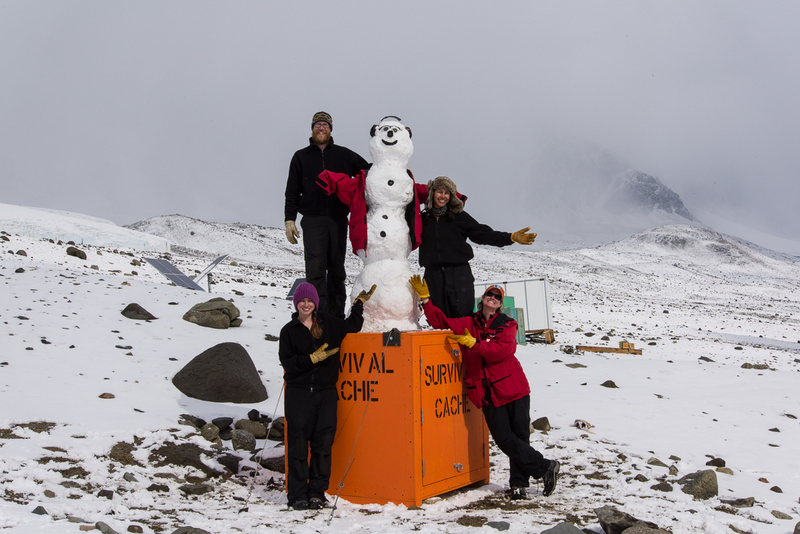 It was the limnology team’s day off from sampling, and on the spur of the moment they decided to build a snowman with snow collected from the helo pad, which they dressed in a regulation USAP “little red” jacket. Naturally, a snowball fight followed. Looking in the direction of Lake Hoare, the sky was clearing, so the helicopter came to drop off passengers and pick us up. That’s the helo pad in the foreground. Most camps just have a patch of flat ground, but since there isn’t one large enough at Bonney, a wooden platform serves as the helo pad. The weather cleared and the helicopter pilot arrived with two grad students from a different water-sampling research project, on their way to a site on the other lobe of the lake. Forrest and I boarded the helo and rode to Lake Hoare. As we landed, it started snowing hard there, fog rolled in and pilot ended up waiting in the Lake Hoare hut for about three hours before deciding it was clear enough to take off again. Fortunately, they had a tent set up that nobody is using so I didn’t have to pitch mine on snowy ground! What an out of body experience this must be, on the shores of an Antarctic Lake District. Why are they referred to as Dry Valleys? Any mountain in the distance? They are called the Dry Valleys because they are in fact, mostly covered with gravel, and are the largest ice-free area in Antarctica.